This is a comparison of modules that can be used to get dependency information for Perl modules. I was working on a review of modules for making HTTP requests, and realised that some of them were pulling in a lot of other modules. I wanted to be able to visualize this, so had a look to see what was on CPAN. If you don't want to read this (long) review, skip to the Conclusion. The following is a list of the modules I'm aware of so far. Please let me know if I've missed any: neilb at cpan dot org. I've also included a module that I've written, Devel::DependencyGrapher, since none of the other modules did quite what I was looking for. It's not on CPAN yet. Parsing one of the metadata files in the target module's distribution. This obviously relies on the module's author correctly listing all dependencies, and might not distinguish between build/test and run-time dependencies. Parsing the source of the target module, looking for use and require statements. This will find most potential dependencies, but in doing so might report modules that will never be used on your platform. It will also miss modules loaded via DBI->connect, some plugin mechanism, eval, or require $module, for example File::Spec's require "File/Spec/$module.pm";. Looking to see what modules are loaded during runtime, using one of several approaches. The advantage of this approach is that you only see the modules that were actually used, and the File::Spec trickery won't fool it. The disadvantage is that you might miss dependencies, for example if the modules used vary based on the inputs. Each approach has its use, but be aware of the limitations when you're using any of these. Each module is presented in turn, with a comparison and conclusion at the end. Note that modules are given as partial paths rather than module names, as that's what is used as the key in %INC. Devel::Dependencies works at compile time. It uses the %INC hash to identify what modules have been loaded. This shows you all modules that were loaded, but no sense of which modules are dependent on which. This module was written by Jean-Louis Leroy, as a by-product of writing his article A Timely Start, where he describes investigating why a Perl script ran 10 times slower than the shell script it replaced. Interestingly, it was a similar line of questioning that led me to do this review, and now I've taken over maintenance of this module. Having looked at all the other modules presented here, none of them did exactly what I was after. So I've created a module which just about does what I wanted. It's not on CPAN yet, partly because I'm not sure what to call it. My first attempt used the trick of putting a function at the head of @INC, but the trouble is that you only get to hear about the first time a module is used/required. This generates a data file, which is currently a simple text file. I've got a script takes one or more module names, reads the data file, and spits out a graph in the dot format used by graphviz. This lets you generate a data file for a large application that uses a lot of modules, and then pick a specific module to see the dependency graph for. There are a number of things I might add in the near future: the ability to leave out core modules; mapping modules to distributions. Now I'm maintainer of Devel::Dependencies, I will probably fold this module into that distribution, maybe as Devel::Dependencies::Grapher, thought that's a bit of a mouthful! The module was obviously called Loaded in the past; it's trying to delete itself from the output, but uses the old name. I've submitted a bug on this, with suggested patch. This is the only "%INC dumping" module that prints the path rather than the module name. I think most of the time I'd want the name, but I can imagine there might be times when this will be handy. The documentation covers the other options, such as noversion which supppresses display of version numbers in the output. Any use of the strict pragma won't be reported, as Devel::Modlist removes it from the output, as it uses strict itself. I think it would be better for Devel::Modlist to not use strict itself — all the tests could use strict, so the author wouldn't miss anything. You can also run it with perl -MDevel::TraceUse, but with -d:TraceUse you get more information. Devel::TraceUse will also show where a module failed to load, and if it doesn't know which module loaded a particular module (for example if loaded in an eval and you were using -MDevel::Dependencies), it will be listed at the end. It started as a hack by chromatic in the "Perl Hacks" book. After using it for a while, I found it had some issues, so I fixed the bugs, and ended up rewriting it almost entirely. I'm now its maintainer. Philippe gave a remote lightning talk at YAPC::Europe 2010 — a video showing the differences between Devel::TraceUse 1.00 (chromatic's) and Devel::TraceUse 2.00 (Philippe's). Devel::TraceUse uses the technique I used with the first version of my module: it installs a coderef at the start of @INC. The referenced function then gets called every time require tries to load a module; it works out who the caller is and what module is being loaded, and stores this info. It then returns undef, so that require will continue working down @INC. The disadvantage of this approach is that the module will only see the first time a module is used. You still get to see all modules that are loaded by your code, but you don't get to see the full dependency graph. Dist::Requires extracts prerequisite information from a metadata file for a distribution. You can either tell it the path to a gzip'd tarball, or the path to the directory where a distribution has been unpacked. Dist::Requires will try and configure the distribution using its build mechanism. By default Dist::Requires will not list core modules. You can override this behaviour with the filter argument, which takes a hashref; in this you list any modules you want to filter out of the pre-requisites. Passing an empty hashref will show all prerequisites. You can specify the version of perl you're interested in, and Dist::Requires will only exclude core modules from that version (identified using /Module::CoreList). This doesn't provide any mechanism for recursively identifying prerequisites; you'd have to roll one of those for yourself, by repeatedly calling the prerequisites method and either finding local copies of modules or downloading their distributions. If you want to find recursive dependencies in this way, you'd be better off using CPAN::FindDependencies, as it already does that. The documentation suggests that Dist::Requires isn't very robust (compared to CPAN and cpanm), but in the few simple examples I tried it seemed to work fine. It is some of the cleanest looking code I've seen while reviewing modules. Module::Dependency includes 3 main modules: the indexer, an info module, and a grapher. The indexer parses local Perl files (modules and scripts) and extracts information from them, and then stores it in a Storable. The grapher takes one or more modules and pulls dependency information from the Storable, to produce a number of formats. The problem with parsing (rather than running) the source is that you might end up inferring dependencies inaccurately. For example, one module might have logic that decides which of two modules to require, but the parsing approach might see assume that both are dependencies. Module::Depends uses Parse::CPAN::Meta to extract dependency information from the CPAN metadata files in an unpacked distribution. Not all dists contain a metadata file. Module distributions are often created by fallible humans, as opposed to the less fallible Dist::Zilla, for example. So the distribution's metadata might be incomplete, or just plain wrong. And should you list all dependencies on core modules? Module::Depends::Tree provides the heaving lifting for the deptree script, which is included in the distribution. Neither the module nor the script have any documentation to talk of, but the script only has two command-line options: mirror identifies a CPAN mirror for the module to use; workdir specifies a local directory to use as a cache for distribution tarballs. Which is more human-friendly than computer-friendly. This is a handy script for identifying all the dists that a given module depends on, as it ignores core modules. the intent was, indeed, to be human readable. If I recall correctly, I had a project on two different machines and I wanted to see the 150-or-so modules that the project used, and what the differences were between the two machines. I would run the tree program and then diff the output to ID problems. module: the name of the module. pragma: if the module is a pragma, then this will also be set to the module name. version: if a version was specified, it will appear here. imports: an array ref, which contains any imported items. Note that require 5.16.0 doesn't get included in the output (it does with some of the modules here). And I'm not sure why the constant definition doesn't appear in the imports list. I was going to report this as a bug, but noticed that the distribution has a testsuite for this (use version), so it's obviously intentional. WARNING! From here down reliability drops rapidly! In addition to the above, Module::Info can also tell you: the path where the module is installed, the version, whether it's a core module, what packages are defined in it, a list of subroutines defined, superclasses, and what subroutines are called. It uses the B::Utils module and caveats "lots of cargo-culting from B::Deparse", which I enjoyed. I haven't really done this module justice, but I can imagine that now it's tucked away in my grey matter, I might find myself using it again. When installing this, some of the tests failed. They looked harmless so I did a force install. The dist_requires() and dist_build_requires() methods return an instance of Module::Math::Depends. You can't get a list of modules from this, just the whole lot via as_string(). The dist_depends() method returns the union of dist_requires() and dist_build_requires(). Module::Inspector was clearly meant to provide a lot more — the TO DO section of the pod says "Implement most of the functionality". It was created by the prolific Adam Kennedy, but given he's not active in the Perl world right now, this module seems unlikely to progress. As a result, Module::MakefilePL::Parse fails to find any dependencies. This module is no longer supported: its CPAN support status is 'abandoned'. So don't use it. It uses Module::ExtractUse to get this information. The get() method used in the first example takes a string from the left-hand column and returns an array ref containing what you see on the right. Module::Overview also provides a graph() method, which returns an instance of Graph::Easy containing the same information in the table. Module::ParseDeps parses files in a CPAN distribution to identify dependencies. The files it looks for are META.yml, *.meta, and Makefile.PL. If a Makefile.PL is found, it is parsed by Module::MakefilePL::Parse, which is also included in this review. Error parsing META file:  at ./module-parsedeps.pl line 14. So even though I get some error messages, it does get the dependencies right. It doesn't do so well with the Template Toolkit though: I get one error message and no dependencies. Module::ParseDeps hasn't been updated since 2004, so I'm guessing that formats for the various files have changed, which is why it doesn't work very well. The module works by looking at the %INC hash in an END block. Unlike some of the other modules which use this technique, it also gets the version of every module used, and includes that in the output. Note that the output includes Module::PrintUsed itself, even though it's not actually a dependency of the script. The module could just exclude itself from the list, but given it's working off %INC, it has no way of knowing whether one of the other modules used it as well. The only problem is that the default output will also still be generated. I've submitted an RT issue for this, suggesting that there be a mechanism for suppressing the default output. The dependencies are listed as partial paths, eg HTTP/Lite.pm rather than HTTP::Lite. I've submitted an RT issue suggesting a name key be added to the hash for each dependency. 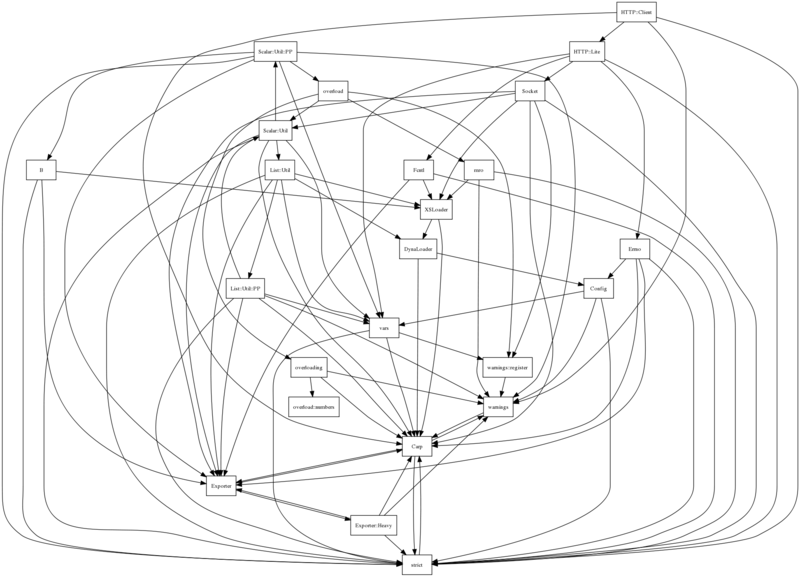 the used_by key means you can generate a true dependency graph, rather than just a flat list of all dependencies. If you set recurse to 1, it will recurse through all dependencies found, producing the complete dependency graph. Unfortunately Module::ScanDeps currently has a bug which results in it pulling a whole load of non-dependencies if you use strict. Note that here only 'module' types are displayed. Other types are 'autoload', 'data', and 'shared'. When recursing you might get a bunch of these, and there's currently no way to state that you only want to see entries of type 'module'. Module::ScanDeps is a powerful module, but I wouldn't use it at the moment. Other modules are easier to use for my purposes, and it doesn't seem to be actively supported at the moment: there are too many outstanding issues, including the critical one mentioned above, which was reported in November 2011.
modules_used_in_files takes a list of file names/paths, and returns a list of module names. modules_used_in_document takes a PPI::Document and returns a list of module names. This is a nice module: a clear simple API, and seems to work fine. Not sure I'd do that, but you can always skip it in the output. As you can see, this would be most useful for generating dependency information where you have a tree of source, for example for one project. The distribution includes a script scan_prerequs, which uses File::Find to traverse a directory in this way. A neat addition to this would be an option to follow dependencies: having identified HTTP::Client as a dependency, it could search @INC looking for it, and if it's found, scan that as well. So, very different from the graph generated by Devel::DependencyGrapher, but similar to that generated by Module::Dependency. CPAN::Dependency, CPAN::FindDependencies, Module::Depends, Dist::Requires, and Module::Depends::Tree all work by processing the metadata files from distributions. There are two main disadvantages with this approach: the module's author may not have listed some dependencies, and where the metadata is grabbed from CPAN, it might be for different versions of some of the modules than are installed locally. Module::Dependency::Grapher, Module::Extract::Use, Module::ExtractUse, Module::Info, Module::ScanDeps, and Perl::PrereqScanner work by parsing or compiling source code. These have the advantage that they're (probably) looking at the versions of the modules that you're using, but they might infer dependencies that aren't actually dependencies. Devel::Dependencies, Devel::TraceUser, Module::PrintUsed, Devel::Modlist, App::FatPacker::Trace, and Devel::DependencyGrapher work by 'reflection': looking at what modules were loaded during compile time. This gives a good indication of how much code was actually loaded, but only shows you for a particular run or runs. So not a comprehensive view of dependencies, and doesn't cover build- and test-time dependencies. If you want to know all the distributions you'd need for a module, perhaps because you want to bundle them all together, then I think CPAN::FindDependencies is the best bet. This isn't surprising, since the module is by David Cantrell, who runs the CPAN Dependencies service. If you're not sure you want to trust the accuracy of the metadata in distributions, then you could use one of the modules which parses code to identify all possible dependencies. For this I'd use Module::Extract::Use, as it's built on top of PPI, and provides a bit more information than Perl::PrereqScanner. I think I need to do a more rigorous bake-off to see which of the parsing-based modules is most reliable.